Our continued goal is to make sure you can benefit from our most advanced combinations of hard- and software products. On this note, we are happy to introduce a new attractive product bundle combining our actiCHamp amplifier product line with BrainVision Recorder, Brain Product´s renowned commercial recording software. The product bundle, which includes a complete recording system, electrode sets, caps, consumables as well as the recording software, is made available to you at the most convenient price. It was the middle of the year 2011 when Brain Products released a new groundbreaking product called actiCHamp, a 24-bit, battery supplied amplifier offering up to 160 EEG channels, 8 AUX inputs for peripheral signal measurements, a sampling frequency of up to 100 KHz as well as 8-bit Input and Output trigger ports. Additionally, the acquisition system is provided with Brain Product´s well-known active electrodes along with a set of caps and consumables. Previous versions of the actiCHamp product bundle included the recording software BrainVision PyCorder, which is offered as open source software providing basic features to display, monitor, and save data as well as to setup an experiment. More advanced features (e.g. trigger port setting, online data segmentation and averaging) can be developed and added by the users themselves, depending on their individual needs. After several years and hundreds of sales finalized worldwide, we have decided to upgrade the actiCHamp product bundle to make it an even more attractive solution for you. The new bundle, which now includes our commercially available recording software BrainVision Recorder, will replace the previous product set with immediate effect. Possibility to utilize the real hardware potential of the actiCHamp amplifier by recording EEG with up to 100 kHz. Easy and flexible I/O trigger port handling. Ready-to-use interface to setup MyButton, an innovative and mostly unexplored solution integrated in the amplifier, allowing to control the entire experiment by just a sequence of clicks. Options for online segmentation, baseline correction, artefact rejection, and averaging. Advanced visualization options to display individual channels with customized sensitivity and timebase. Straightforward solution to import cap configuration files with exact labeling and coordinates. Direct access to Brain Product`s renowned technical support expertise. 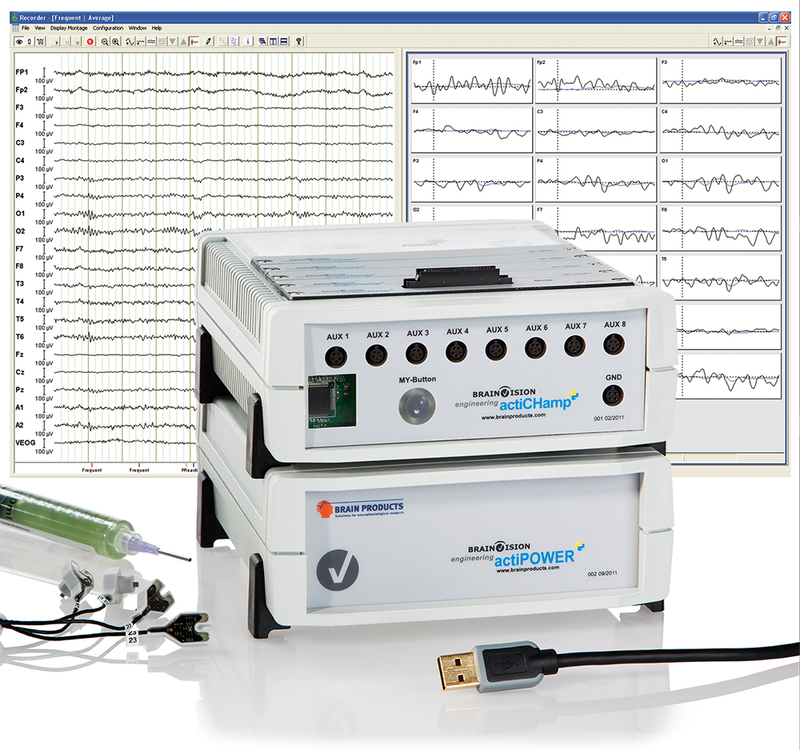 Brain Products will continue to offer PyCorder as open source EEG recording software for actiCHamp at no charge. The software may be downloaded directly from the actiCHamp/PyCorder user forum or from the Brain Products Application Suite DVD supplied with the new product bundle. So much for the technical advantages of the actiCHamp and BrainVision Recorder combination, but what about the costs? Well, here again is the good news: You will be able to purchase the new product bundles at an incredible value. For example, our 160-channel actiCHamp recording system including electrode sets, caps, consumables, and recording software will be available for less than 50.000 € [*]. If you are already using actiCHamp and fear we may have forgotten about you, do not worry! In fact, we have put together a special treat for you – get BrainVision Recorder for 30% off the regular price for a first software license! Are you interested in testing or receiving more information on our actiCHamp and BrainVision Recorder bundle? Please don’t hesitate to contact us at sales@brainproducts.com or your local representative. We will be happy to assist you with your queries.